Most of the travelling I have done in my life has been on motorcycles. On the ABC radio recently they asked for listeners to recall what the year 1963 meant to them. For me it was the year I learnt to ride motorbikes and have been doing so ever since. 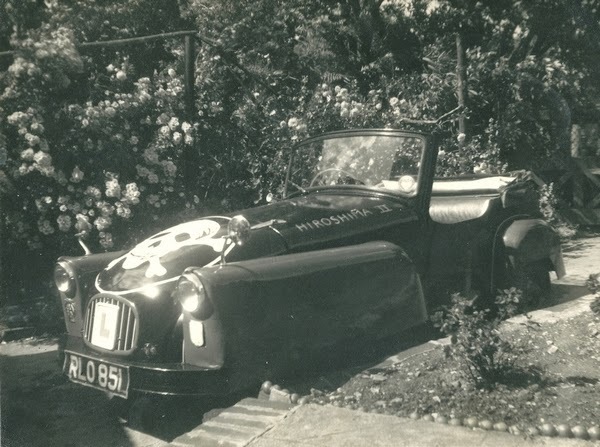 The previous year, whilst finishing school my father helped me rebuild a crashed 3 wheel Bond Minicar and, in this, because it had no reverse gear, I obtained a motorcycle license. 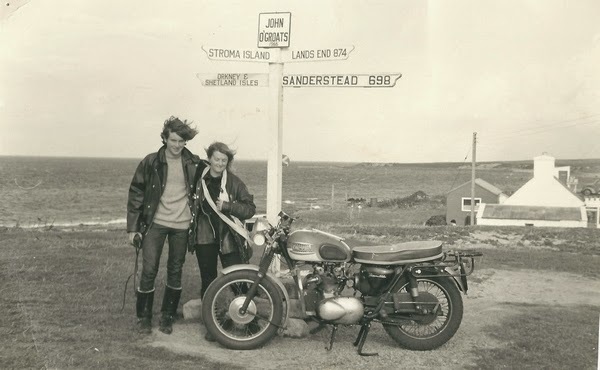 My school friend, Lynn Filmore, and I toured the South West of England in the Bond (named Hiroshima 2) and en route met a couple of lads on bikes who invited us for a ride with them. My pilot took a bend too fast and I ended up in hospital with concussion and cracked ribs. 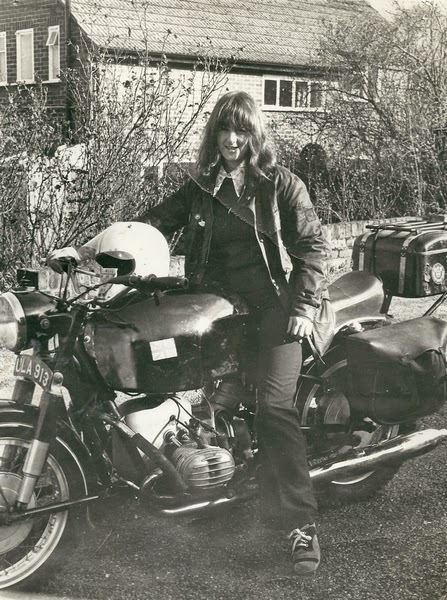 From then on I decided that I would take all bike riding into my own hands, joined the Saltbox motorcycle club in Biggin Hill near the famous WW2 Airfield, and bought my own bike. 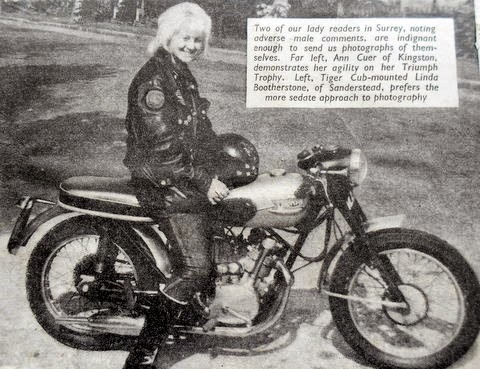 This was a 250 BSA C10L upon which Lynn and I learnt to ride. Unfortunately, during one of her outings a gentleman in a Rover made a wrong turn, she ended up on the bonnet and the bike needed new forks. Having saved my sixpences (in a Dimple whisky bottle) I lashed out its contents, all of 40 pounds, on a Triumph 200cc Tiger Cub, and made several attempts at getting further than the North Circular road but the bikes habit of throwing big ends deterred me so I graduated to a Triumph 3TA which easily transported me to the Lake District and North Wales. A great little bike, it would do 90mph with 70mpg. The next move up was to a 500cc 5TA, which, repainted go-faster Bonnneville blue and fitted with clip-ons and rear-sets, took me to many Rallies in UK and Europe, including the Dragon Rally, the Chamois, the Stella Alpine and the FIM Rally in Moscow in 1967 where I met a couple of Aussie guys on BMWs who were touring round the world. I travelled with one of them to the Troll Rally in Norway the following year and noted that, while he sat back and boiled the billy each night, I was still busy adjusting my chain and screwing up all the bolts that had loosened during the days ride. 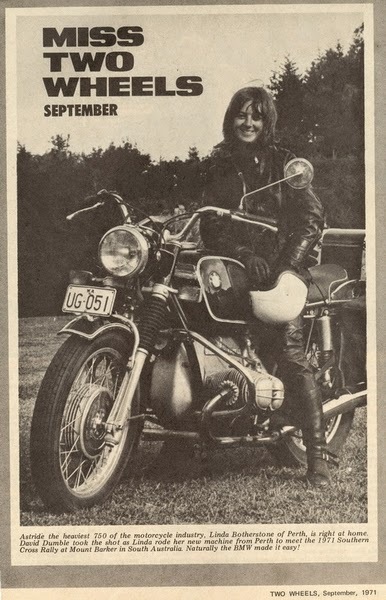 This proved to me that BMWs needed less maintenance than Triumphs so I bought a 1960 R60 and took it with me on the ship when I emigrated to Oz in 1969. Unloading it in Melbourne I rode it across to Adelaide and then back east to Sydney stopping at the Kangaroo Rally in Ballarat. In Sydney I shared a flat with two other immigrants, Jacky and Angie Griffin who soon realized that bikes were the way to travel and bought their own. We befriended members of the Willoughby Motorcycle Club and the University of NSW MCC. I was going to enter my BM in the Powder Puff Derby held at Oran Park (1970) but was fortunately lent a 250 Suzuki Savage by Ryans of Parramatta. They had been sponsors in the Road Safety Run in which I had won best Solo and best Team with Sandra Davis and her sister Deirdre. In the race Peggy Hyde won on her 500cc Kawasaki, Sandra came second on her 350 RD Yammy and I was third. When we left Sydney in 1970 for the West I suffered a dropped valve on the BM while crossing the Hay plains which meant a total rebuild in Adelaide before continuing across the Nullarbor to Perth. There I raced at Wanneroo Park on a borrowed 250 Desmo Ducati and traded in my old BM for a brand new R60/5, the only new vehicle I have ever owned. 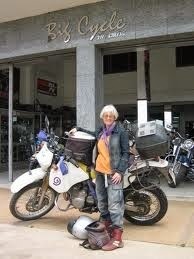 With Jacky on her 305 Dream and Angie on her 350 Honda twin we took off on a 3 month tour around Oz. Riding back to Sydney we went up to Cairns then returned to Townsville to go inland to Tennant Creek, north to Darwin and then back to Alice Springs putting our bikes on the old Ghan to return to Adelaide. The roads in the interior in those days were mainly dirt and the two girls (21 and 22 years old), inexperienced motorcyclists, did magnificently and took everything in their stride. See our book 'Three Wandering Poms'. 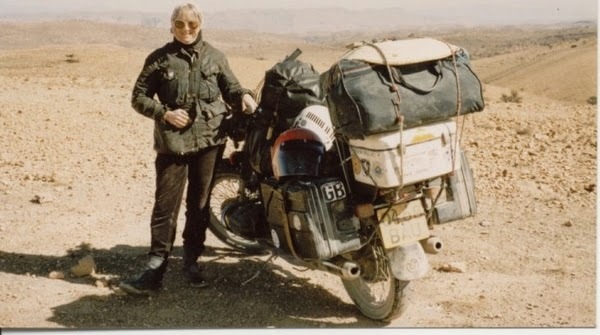 In 1974 I was in UK and looking for another challenge so I bought a 1957 BMW R50 to ride down through Africa. During the 15 month trip it suffered broken suspension (Sahara), shot main bearings (Kenya) dropped a valve (Rhodesia) and cracked a piston (South Africa) but in Africa everything is fixable and I had a great time. The bike was rebuilt in South Africa by an Afrikaans friend (who is now living in NZ and has recently bought the bike from me). I spent a couple of years in South Africa with this bike using it to explore the Kalahari and Namib regions while I was working in Windhoek. I finally shipped it back to Australia where it attended many rallies including the Worlds End in the Flinders Ranges SA. Succumbing to the luxury of an electric start on a later BM I bought a 1978 R60/7 from Les Duffield from Adelaide, a well known character in those parts, and this was shipped back to UK where I rode it for the next 18 years around Europe and North Africa. I lived in Spain for most of that time, attending rallies in Spain, Portugal and Germany, and one of its longest trips was to the Strangers Rally in Odessa , Ukraine in 1995 See my book 'Where Angels Fear to Tread' for more details of these travels. The R60/7 was a wonderful bike, it never really let me down and I used to have it serviced in Germany whenever I rode through. 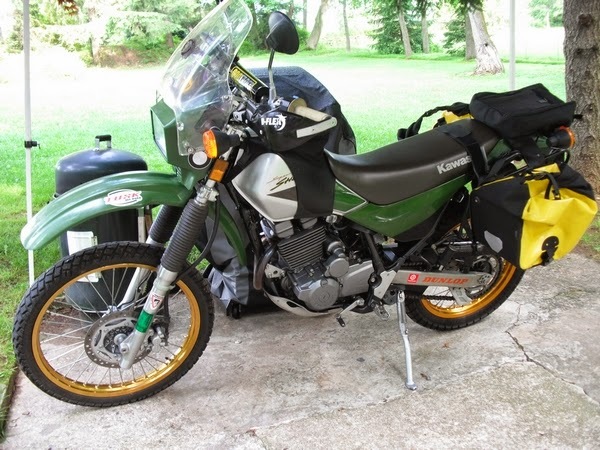 This bike is now retired there in my friends garage near Stuttgart where I left it when I acquired a 1996 Suzuki DR650 to do my overland trip in 2005/7. Leaving from Germany I travelled through to Eastern Europe, Turkey, Iran, Pakistan, India, Nepal and then flew the bike over Myanmar to Thailand. After a foray into Laos and Cambodia I travelled south to Malaysia then across to Indonesia and finally shipped he bike to Darwin from East Timor. A great trip you can see the details on this website. I sincerely believe that the old BMs are the best for long distance touring but have to admit that I cannot push then around any more and now ride a Kawasaki 250 Sherpa.This bike I bought in Pennsylvania in 2010 with the intention of taking it to South America after I did some touring in Canada and North America but ill health prevented me from doing this and I finally imported it to Australia where it is now taking me to various bike meetings. Other travelling I have done without the bike has been trekking in the Himalayas and walking on the pilgrim track of the Camino de Santiago in Northern Spain. Linda's still riding from ABC Open West Coast SA on Vimeo.